Learn more about the statistical datasets and sources available in Data Planet. After selecting the data, you can display that data in a number of ways. By selecting one of the four icons in the menu bar, you can show the data as trends over time, a comparative ranking, a map, or a pie chart. The Show/Hide Data option allows you the choice of displaying or not displaying data values with the visualization. Another option on the tool bar is the Calculator button that allows you to create formulas based on the data values selected and define new columns for displaying the calculated new values. For example, in the infographic below, a new column has been created using the Calculator that shows the difference from prior year in the value of platinum. For more on the Calculator, see Interface Tips and Tricks #13. 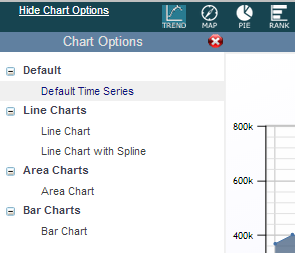 To change colors in a chart, click on the variable type displaying below the chart, eg, "Closing Value" in the example above. A tool opens up that allows you to change the line color. Other methods of customizing your data views include modifying which criteria you display by selecting specific time periods and variables in the CriteriaPanel.